Meir Yedid was the first person to win the Society Of American Magician's Close-Up Magic Championship more than once. He was also awarded the Society's rarely presented Originality Medal. Meir has spent the last 30 years touring throughout the world performing and teaching his brand of creative magic. This book features some of Meir's offbeat magic with coins, cards, sponges, cereal and fingers. As an added bonus the book includes additional routines by Gene Maze and Joe Safuto. All of these routines are visual and memorable. 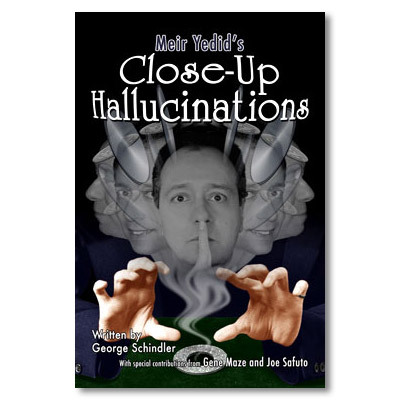 Hallucination: A beautiful coin routine Meir used to open all of his close-up shows. Done to music, three coins appear out of thin air and just as mysteriously vanish into a hole that is later visually healed shut. Ribit-Rabbit: Using new sponge ball techniques three sponges jump from hand to hand and then morph into a sponge rabbit. Disengaged Digit: Your index finger vanishes under impossible conditions. Card Flakes: A quirky routine where a corn flakes box changes into a card case. The card case is full of corn flakes. You eat some of the corn flakes, begin to choke and spit out an entire deck of cards. Gene Maze's Box Top: A memorable card routine where the cards are shuffled through a card case and when the card case is opened it contains the signed selection. Joe Safuto's Porous Potholder: Often used as a closer, this beautifully constructed routine has four cards pass through a pot holder one at a time and concludes with two surprise productions. Also taught are all of the techniques used within the routines. Original techniques include: Almost Perfect Vanish, Half-Fist Sponge Steal, Tabled One-Hand Vanish, and much more. Written by George Schindler and illustrated by Fred Kraus. Second edition published by Meir Yedid Magic in 2011. Pages: 70 - 6x9" paperback, perfect bound with color cover. 65-illustrations.